Company meetings are opportune moments to distribute print products. They can make a person look more professional, encourage productivity and provide hard facts about the matter at hand. Digital technologies are useful but when it comes to a meeting, it can appear rude if someone takes out a cellphone or laptop – even if they are just taking notes. It can seem like they aren't prepared or aren't paying attention. Professionals should stick to print strategies to dominate at meetings. 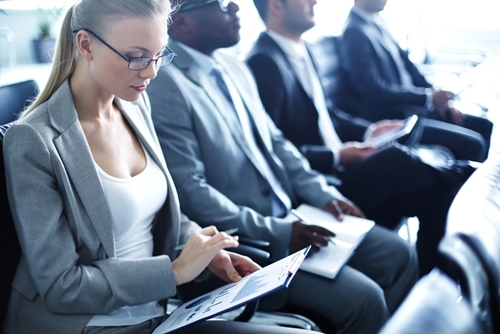 Here are some print products that can make a lasting good impression at a meeting. If all 500 employees who attended a business meeting were typing away on laptops would anyone even be able to hear the CEO speak? What if someone is put on the spot? If they don't have a response prepared, they'll have to retrieve one in a pinch. But this is no time for someone to start searching around on Google – with all eyes on him or her. This is an opportune moment for a notepad. Prior to the meeting, the employee can jot down some notes, thoughts and questions and glance at it if he or she loses his or her train of thought during the meeting. Showing up at a meeting prepared is very important. A little preparation can go a long way, according to Demand Media. While some notes can help a person get collected and organized throughout a meeting, it's important that when it comes to the talking, he or she doesn't read the words verbatim, warned the source. This can make someone sound unnatural and disconnected and it'll be noticeable. Making a good impression at the meeting will set a precedent for an employee. In addition to wooing everyone with short notes and solid questions, people should be ready for face-to-face interactions at meetings. A business card is quick and easy. It's inexpensive yet it's enough to demonstrate professionalism. The little piece of paper is a first chance to make a good impression on colleagues, stated Entrepreneur. Exchanging information via cellphones or tablets at meetings isn't always possible. Typically when people have to attend a meeting or several in a day, it cuts out a chunk of the work schedule but the responsibilities still have to be taken care of before someone leaves. This means that people may hurry out of the meeting room so they can get back to work. It can be off-putting for someone to have to stop and enter data into a cell phone. But a person will remember if life is made easy for them. Employees can pull out a business card and get in touch with the other person at a more convenient time. Meetings are also a great time to give handouts. Whether a person is holding the meeting or attending it – printed flyers, catalogs and documents demonstrate preparation. Entrepreneurs or employees can set them up by the door for people to take on the way in or out. These products will give everyone something to talk about. When a large group of people get together, initiating conversation can be awkward at first. What's more, handouts can save time in the long run. People are bound to ask plenty of questions and some even inquire about information that's already been discussed. Giving people a physical copy of the agenda can save the employee from embarrassing him or herself with redundant questions but also encourage participation. It's unrealistic to expect everyone to tune in during the entire meeting, and a physical outline can give people a way to follow along and keep up even if their attention wanders off to something else for a moment. Professionals should check their calendars and stock up for the next meeting. Print products can set them apart from the crowd.